HOME ADDRESS: Jhartarant, Rourkela, Odisha, India. FAMILY: Late Sibsay Xaxa (Father), Bani Xaxa (Mother), Subash Xaxa, Ajit Xaxa (Brothers), Hema Xaxa (Sister). ACADEMIC QUALIFICATION: Plus Two first year student of Rishikesh Ray Mohavidyalaya, Rourkela. * She was part of the Rising Students Club that won the title in the 2nd Indian Women’s League (IWL), held at Shillong, Meghalaya from March 27 to April 14, 2018. * She was a member of the Cuttack-based Rising Students Club that finished runners-up in the 1st Indian Women’s League, held at Ambedkar Stadium in Delhi from Jan 28 to Feb 14, 2017. * She was a member of the Odisha team that won the East Zone Group-A title in the 21st Senior Women National Football Championship at Kalyani in West Bengal on Dec 26, 2015. She also emerged the top-scorer, firing 12 goals in three matches. * Scored 12 goals in three matches to power Odisha into the final of the Girls Junior National Football Championship being played at Cuttack from Nov 20, 2013. 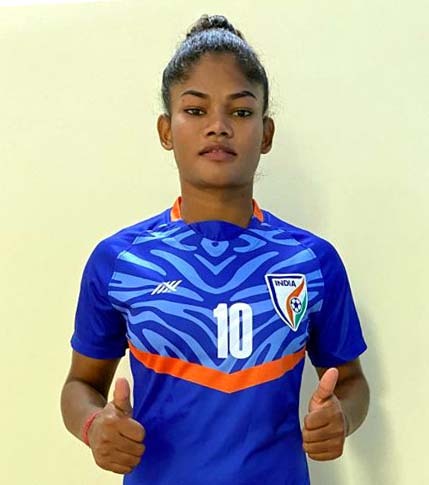 * She was part of the Indian women team that won all four of their international friendlies during a tour of Hong Kong and Indonesia from Jan 21-30, 2019. Also scored one goal against Hong Kong. * Scored both the goals in Indian’s 2-0 win over Malaysia in the women’s international friendly in Kuala Lumpur on July 31, 2017. * She was a member of the Indian women football team that won gold medal in the 12th South Asian Games at Jawaharlal Nehru Stadium in Shillong, Meghalaya on Feb 15, 2016. * Represented India in the AFC U-19 Women’s Championship, held at Amman (Jordan) from Nov 5 to 9, 2014. She also scored a goal in India`s 3-1 win over Lebanon. * Bagged the 2015 AIFF Emerging Woman Footballer of the Year Award in Goa on Dec 20, 2015. * Her elder sister Hema also plays football and represented Odisha in 2013 Girls Junior National Football Championship at Cuttack. * The sisters belong to very poor family.